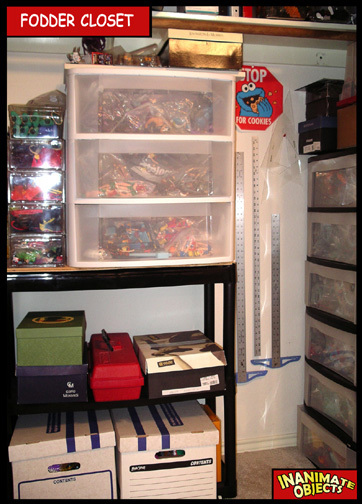 Inanimate Objects » How do you store your stock parts and fodder? How do you store your stock parts and fodder? Everyone has their own system and space. On my work desk, I keep a transparent tower of drawers. It’s perfect for small parts like heads, limbs, hats, etc. (Found at the Container Store.) I also maintain a closet that has a good deal of storage capacity. In addition to housing certain parts of my collection, it currently holds several large drawers with semi-transparent faces. 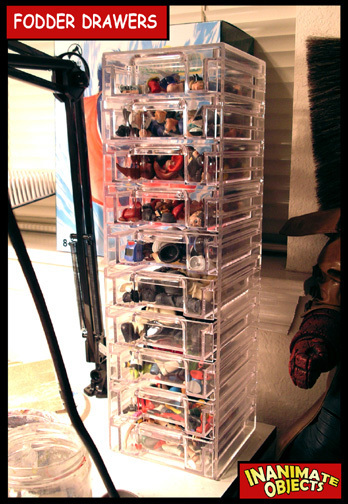 Each is organized to hold certain types of figures and body parts. Near it are several medium sized transparent drawers for capes and other accessories. And of course, several shoe and file boxes, each holding a different category of stuff. One thing to keep in mind: some figures can become terribly warped if left under weights for long periods of time. Make sure those kinds of figures don’t get buried under other figures for too long.